The 6th edition of Rencontre photographique du Kamouraska is taking place in the Lower Saint Lawrence region of Québec from June 20 to August 3, 2014. Just like Rencontres de la photographie en Gaspésie, the event showcases the creation and presentation of photography, and is held in close collaboration with eight municipalities of the Kamouraska RCM. Rencontre photographique du Kamouraska makes it possible for the public to experience photography in the heart of a region gifted with unique landscapes, by way of photo exhibits and installations, lectures, roundtables, workshops and open-air photo walkways. 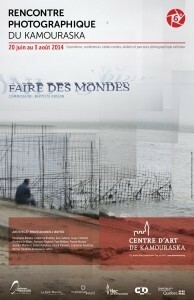 Guest artists and professionals: Véronique Béland, Catherine Bodmer, Ève Cadieux, Serge Clément, Florence Le Blanc, François Gagnon, Yves Médam, Franck Michel, Jocelyn Philibert, Émilie Rondeau, Chuck Samuels, Catherine Tremblay, Michel Tremblay and several others. Rencontres internationales de la photographie en Gaspésie visited Kamouraska on June 21 for a roundtable bringing together representatives of major photography events in Québec, including former Mois de la photo director Chuck Samuels, Michel Tremblay of Zoom Photo Festival de Saguenay and François Gagnon from Rendez-vous photo du Richelieu. Besides providing us with the opportunity to get together for the first time in what is the early history of photo events in Québec, the roundtable allowed us to paint a picture of the principal events of that kind in the province and to consider their internationalization.